This is another in a series of dictionary-type books that cover the works of thinkers of historical significance. The captivating and detailed entries of this volume, put forward in clearly understandable terms, extract the essential ideals of Marx from his voluminous and historically important works. The main source of Marxian doctrine is found, of course, in the three volumes of Das Kapital; every significant and definitive passage from this masterwork is isolated for reference and scrutiny. In addition, many other sources from the vast body of Marx’s writings are exploited. 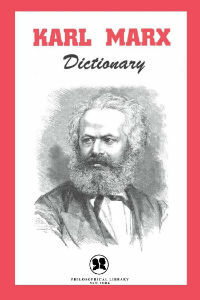 The user of this volume can learn practically all there is to be known of the philosophy of Marxism.